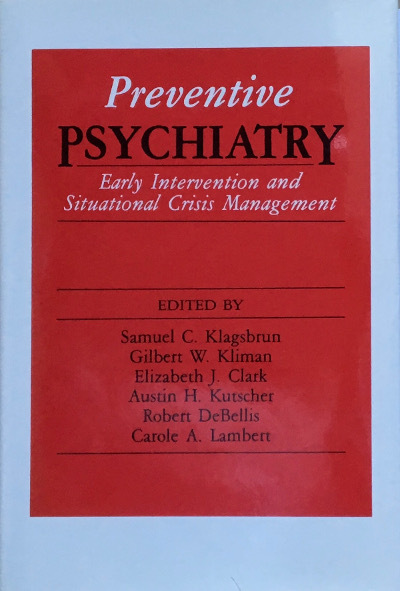 Edited by Samuel C. Klagsbrun, MD, Gilbert W. Kliman, Elizabeth Clark, Austin H Kutscher, et al. This book is based on the premise that many emotional illnesses can be prevented or at least ameliorated by early intervention and appropriate treatment during the incipient stages of illness. By recognizing high-risk situations that are likely to give rise to mental illness, it is possible to apply preventive measures at the time and head off subsequent problems. Written and edited by leading experts in the field, the book explores the principles and actual practices of preventive psychiatry, providing a clear view of current thinking and future directions.